To all our Customers we would like to say thank you for your ongoing support. It has been a while since i made a Blog post and i do apologies for the absences. This year there will be a few releases that will be amazing to collect and the best thing about this is that you would not need to spend any extra money to obtain a nice collectible coin. The coin i am referring to is a new 2015 $2 Red Coloured ANZAC CENTENARY Commemorative coin that will be released for circulation. YES that is right, during the next few weeks the Australian Government will be releasing into circulation this Amazing $2 COLOURED coin. 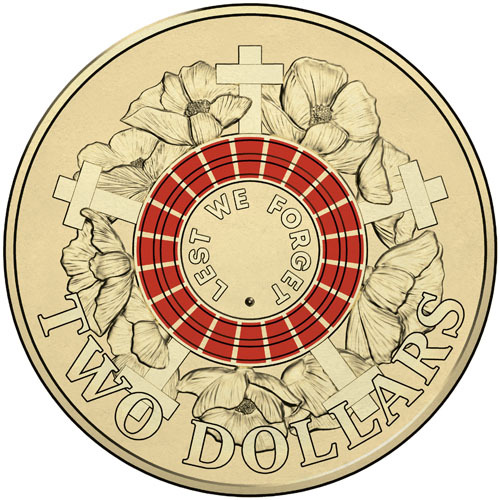 This $2 Red Coloured coin will feature a LEST WE FORGET word in the center of the coin with RED coloured circles which will surround the word, five crosses and poppy flowers will also be present on the coin. To our customers we advise to hunt for these amazing coins in your loose change as an amount of JUST 1.5 million coins will be circulated throughout Australia. Due to the fact that "All" of the coins will be circulated into the market and we know from past experience that distribution of circulated currency can be uneven through different states, we advise our customers to ask relations from other states to look out for these beautifully crafted coins. Just to remind our customers, the 2013 60th anniversary coronation coloured coin that was released for circulation is now priced at $10 - $20 in the open market. 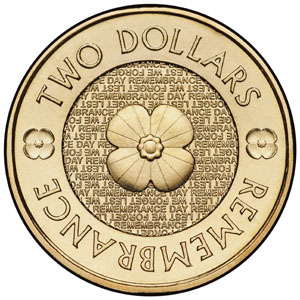 This coin has similar mintage to the 2015 $2 Red ANZAC commemorative coin. I hope to supply everyone with a picture of this magnificent coin soon. Happy hunting and remember to get the whole family/friends to look for this amazing coin. Just a quick note, the 2013 range of coins have arrived, BUT the Royal Australian mint is having some troubles with some of its coins. This coin have been delayed, i do apologies for this as the Royal Australian Mint is working overtime to get these coins ready for dispatch. Hopefully i will have these coins sometime this week. I will keep everyone updated. We also recieved news that the AFL $1 Uncirculated coin will be delayed for 2 weeks. we have just recieved the images for this circulation coin, Sydney Coins and Jewellery your local coin dealer hopes this will help our collectors in the hunt for these new designed $2 coins. If you would like an uncirculated coin, make sure you keep your eye out for them in your change, or look out for them on our website as we will be trying to secure an allocation of these coins from our sources. We will keep you in touch when these coins hit the market. Today your local coin dealer Sydney Coins and Jewellery have finally recieved the 2012 Year of the Dragon Tetra-Decagon (14 sided) 50c piece in the red folder. Images are uploaded to the new release section. We Also have news of a NEW Poppy Designed Circulation $2 coin that will be released sometime this year. This is the first time the Australian Government has changed the design of the $2 coins since 1988. Look out for them in general circulation or if you would like a uncirculated one pleae look out for them on our website, we will be releasing images soon for this coin. Boy what a busy week we had, this week we have been over run with orders for the new 2013 products offered by the Royal Australian Mint, thou the products are due for release on 5th November 2012 we have been flooded with orders. For those who do not know here is alittle insight in why new release products dont hit the selves straight away when you see the advertising. The two mints (Royal Australian Mint and Perth Mint) have an embargo date on when you can advertise there new release products . This is done to give all the dealers a fair go in selling the new releases. They normally have about a 1-2 weeks delay in the offical release of the products. With the embargo lifted on the Royal Australian Mint New Releases, whats hot has been very clear. A BIG hello to all sydney coins customers, today i would like to discuss what you would be expecting for the chirstmas period releases. We will completing our end of year chirstmas cataloge soon with all these coins avaiable for order so dont forget to sign up for our news letter. Images for these coins will be uploaded to our website as soon as it becomes available. Exciting news today Australia is getting a new range of circulation banknotes, thou the project is ongoing we should see these notes in the market within 2-3 years from now. Also i would like to express again the importance of think twice before you buy. Today i had serveral customers that came in with FAKE 1937 Australian crowns, these knock off copies are thinner then your normal 1937 crowns and do not contain any silver. please be aware if you are offered a 1937 for $3 at your local markets then you need to ask yourself why is the vendor selling them for much lower then just silver price, chances are these coins are copies. Welcome to our new website, please be patient we will have all our product uploaded soon.